Shell has a long history of manufacturing and marketing fuels and chemicals along the River Rhine, an important commercial artery that connects some of Europe’s major economic centres and provides access to the large consumer markets of western and central Europe. We have unlocked additional value by operating our strong refining and chemicals manufacturing assets in an integrated system that includes our supply, trading and marketing businesses. Capacity: 20 million tonnes of crude oil per year. Complex export refinery fully integrated with chemicals production and business. It can process a wide variety of crude oils into high-value fuels and chemicals. Capacity: over 4 million tonnes of products per year. Key products include ethylene, propylene, styrene monomer, propylene oxide and ethylene oxide. Capacity: 17 million tonnes crude oil per year. Supplies about 10% of German demand for diesel and gasoline, about 10% of heating oil demand, around 15% of the kerosene feedstocks for the chemicals industry, and around 10% of bitumen demand. Geographically, Shell’s “Rhine Envelope” covers Europe’s largest short market for oil products and many of the most important clusters of the petrochemicals industry in Europe. Moreover, its location in the centre of Europe provides Shell with access to the wider German and several other European oil markets, as well as global trading options via the Port of Rotterdam. In the past, our three manufacturing assets in the envelope were operated more or less independently of each other. Today, we run our combined refining and chemicals manufacturing assets as one integrated, high-performing system, unlocking new optimisation opportunities for feedstocks and products. Through new ways of working, we are now more effectively leveraging the physical integration of our Moerdijk chemicals plant and the Rheinland steam cracker through the existing pipeline network. This has improved supply reliability for our customers – an important consideration in an increasingly competitive environment – and positions us strongly to respond to growth in the European chemicals market. In 2016, we further strengthened our position in both refining and chemicals with the start-up of a new aromatics unit at the Pernis refinery. The new unit is helping us to grow our profitable European chemicals business through the supply of our own optimised aromatics feedstock from Pernis to the Moerdijk plant. In addition, the crude oil flexibility of both the Pernis and Rheinland refineries has been improved through initiatives including equipment upgrades and process changes. Our fuels business also benefits from integration. For example, in periods of higher market volatility, sites can coordinate their output of various products to meet customer needs in the most efficient way. The plants also benefit from past investments designed to enable them to process a wider range of crude grades to improve site economics. And a newly built rail tank-car loading facility for middle distillates at the Rheinland Refinery further enhances the flexibility of the Envelope to serve customers to the south, west and east of Cologne, making the supply chain even more robust. Shared infrastructure such as strategic depots, pipelines (e.g. 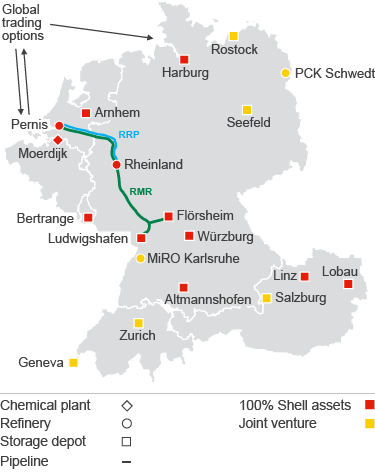 RRP and RMR connecting the Pernis and Rhineland refineries), rail, road and barge transfers enables us to optimise the flow of molecules between the sites and customers, while carefully balancing supply with demand. Additional value is generated by integrating our Retail, Chemicals, Commercial Fuels, Aviation and Bitumen marketing businesses into decision-making processes. Their deep market insights shape our production, supply and trading decisions, enabling us to meet customer demand more efficiently. 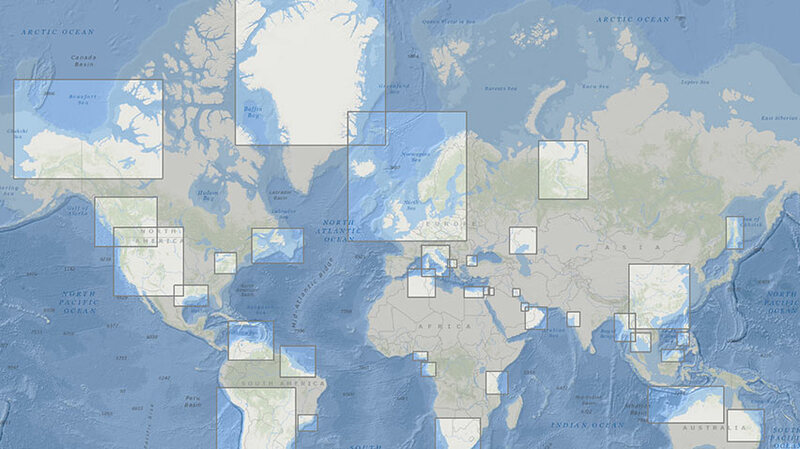 The Envelope has full access to Shell’s global network of trading companies, which is one of the largest energy trading operations in the world.